Millie Osborne at CrossFit LOFT. Enjoy the day with family! Open from 8am-10am on Christmas Eve. Jacob Enriquez inspecting a shipment while on break at UPS. CrossFit Level 1 Certificate Courses: CrossFit Garden City, Iron Oak CrossFit, CrossFit Big Easy, CrossFit Mayhem, ZooTown CrossFit, CrossFit Columbus, CrossFit Flagstaff, Reebok CrossFit Nuernberg, CrossFit Little Hell, CrossFit Oslo, CrossFit Lisses, CrossFit 4TP, Cape CrossFit, CrossFit Peru, CrossFit 1810. CrossFit Level 2 Certificate Courses: CrossFit Ranch, CrossFit Calgary, CrossFit FRA, CrossFit Effects. 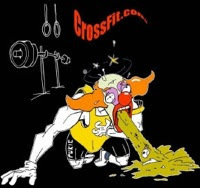 CrossFit Kids Courses: CrossFit King of Prussia, Reebok CrossFit Louvre. "We have converted an extra helicopter hanger into a fully equipped CrossFit gym." - Deputy Chad Dollick, San Diego Sheriff's aviation unit. CrossFit Level 1 Certificate Courses: CrossFit Monrovia, CrossFit King of Prussia, CrossFit Ranch, CrossFit SS, Sandia CrossFit, CrossFit Lackland, Myleo CrossFit, CrossFit LCS, CrossFit Thames, CrossFit Effects (FX), CrossFit Life Performance, CrossFit Jotun. CrossFit Level 2 Certificate Courses: CrossFit Roots, CrossFit Max Effort, Reebok CrossFit Officine, CrossFit Body in Motion, CrossFit High Pulse.